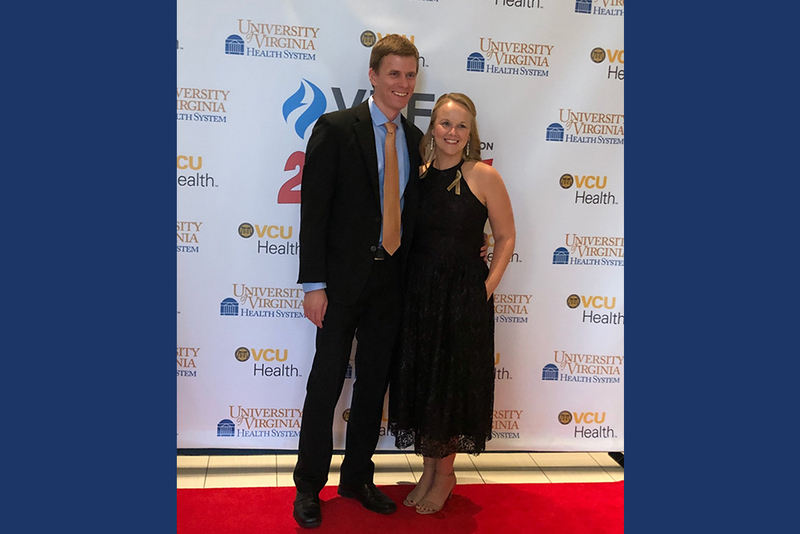 Luella Kaufman Glanzer, a 2006 graduate of Eastern Mennonite University and a current graduate student in the MSN program, was recognized by the Virginia Nursing Association in an annual award spotlighting 40 exceptional rising nursing leaders under age 40. Since 2017, Glanzer has been UVA Health System’s first nursing retention program coordinator. She accepted the award at the annual VNA fall conference in Richmond, Virginia. Her unique position was created to address retention needs and to stabilize the system’s nursing workforce. With a strong foundation in clinical nursing and system-level leadership structures and process, Glanzer has helped to collect nurse and administrator input to generate and implement a multi-faceted retention program. This program has resulted in a linear drop in RN turnover by 1 % over four months, according to Glanzer. Glanzer’s nomination for the award listed several attributes of professional excellence, from servant leadership to effective collaboration and a positive and empowering presence with her colleagues. Glanzer also “offers a unique blend of clinical and leadership attributes that combine to make her effective, team-spirited, and strategic in her role. For someone early in their career, she has achieved a great deal on behalf of the nurses and patients” in the UVA Health System. Glanzer joined UVA after graduation to work in the surgical/trauma ICU. Over the next 10 years, she earned recognition for her clinical expertise in complex critical care and effective collaboration with interdisciplinary teams and nursing colleagues while advancing to the highest staff nurse level. She was elected for a two-year term as president of the Nursing Shared Governance Model, a position in which she collaborated with the chief nursing officer and other senior leadership to address a range of clinical practice, professional development and professional engagement needs. These outcomes include achievement of performance goals for nurse-sensitive clinical metrics, employee engagement metrics, and professional development goals relating to BSN education and nursing certification. Her success in this position led to a request to apply for the new retention program leadership position.